Let’s face it, you’re in need of a general contractor. You’ve got a list of repairs that just keeps getting longer, your bathroom needs a makeover and your kitchen is anything but inviting. At James River Remodeling LLC, we understand that searching for a contractor to complete one or all of these jobs can be a bit tough. You want to make sure you find a company you can trust with expertise you can rely on. With just one call, we can put your worries at bay. Let us show you why Richmond and surrounding area residents call us for all of their home renovation projects. There are many reasons to want to remodel your bathroom or kitchen. Whether you’re updating an older home with an outdated bathroom or wanting to rework your kitchen to better suit the needs of your family, you need a professional who knows the ins and outs of remodeling. 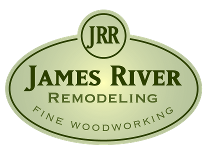 Our 10 years of experience help you rest easy knowing that when you hire James River Remodeling, you’re getting the best Richmond, VA has to offer. Don’t delay, call now to schedule your consultation. We’ll meet you at your home so we can walk through your remodeling vision together, then provide you with our thoughts and a complete estimate within a week of our meeting. Don’t let questions or budget stand in your way, we always have an answer and a solution. Copyright © 2019 James River Remodeling LLC, all rights reserved.